At our most recent SLER discussion, participants noted how many colleagues and senior administrators ask for case studies when wondering how effective virtual worlds are for education. Linden Lab trotted out this post July 10, and since I don't keep up with their blog on a regular basis, I missed it. 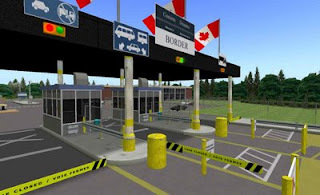 Have a look at “Virtual World Simulation Training Prepares Real Guards on the US-Canadian Border: Loyalist College in Second Life." To learn more, check out this video on YouTube, read this article on the program in the Journal of Virtual Worlds Research, or download our case study PDF. Fred Brecher, who's helping organize the House of Usher project at Richmond, noted in our discussion that many educational technologies have not been subjected to rigorous assessment or case-studies. I suppose virtual worlds are more suspect than, say, a course-management system, since VWs appear game-like. In time we'll get more and more such studies of what works and does non in VWs. My own project, under review by readers, is not quantitative but does show what worked well in SL last year, with my writing students.